Nexus 9 Photo Leaks—Is This Google's Rumored Tablet? We’ve already heard a ton of rumors about Google’s upcoming HTC-designed Nexus 9. We’ve even see a few photos of a keyboard case developed for the new tablet, but until today the device itself had managed to stay out of the spotlight. 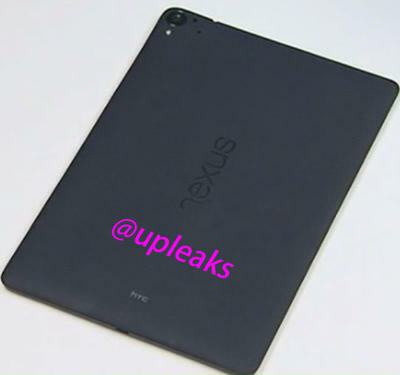 Now it looks like we’re finally getting a first look at the Nexus 9, courtesy of Twitter-based tipster @upleaks. As you can see, the device clearly displays Google’s Nexus logo along its spine, while a smaller HTC logo sits near the bottom. It also packs a micro-USB port at the base, a camera with what looks like LED flash in the top-left corner, and a headphone jack up top. Meanwhile the design looks pretty plain. It’s basically just a big flat slate with curved corners, and the back panel looks more like a plastic shell than the metal we were hoping for. Of course, it’s too soon to make that call for sure. It’s possible the Nexus 9 image we’re looking at here is just a render or an early mockup meant for building new accessories and cases. Based on recent reports the Nexus 9 could be a real beast when it comes to hardware, though there’s nothing here to support or refute those claims. We’re expecting the new tablet to pack an 8.9-inch display, an NVIDIA Tegra K1 processor, 2GB of RAM, 16/32GB of internal storage and an 8-megapixel rear camera with optical image stabilization. We’ve also heard rumors that the device will feature an aluminum “zero-gap” design with tapered edges. Google is expected to unveil the Nexus 9 later this month alongside a Nexus 6 smartphone designed by Motorola and a final build for its new Android L operating system. Rumor has it the company could have an event planned for mid-October, but with time running out it looks like the search giant could opt for a simple press release instead. Either way we can’t wait to see what Google has planned and get our hands on the next generation of Nexus devices.